Some people, especially children, can have severe, life-threatening allergic reactions called anaphylaxis, which can be relieved by a quick injection of epinephrine, also called adrenaline. The antidote can be administered with an auto-injection device, such as the EpiPen, produced by Mylan Pharmaceutical. Mylan found itself at the center of a heated political issue last year after it raised the price of the EpiPen, but a new study focuses not on the device's price, but its availability, although the price may affect how many people actually have the device when they desperately need it. The findings, published in the Annals of Allergy, Asthma and Immunology, conclude that fewer than half the children suffering from anaphylaxis received an injection of epinephrine before being treated at a hospital emergency room. The epinephrine injection doesn't "cure" the allergy but it relieves the worst symptoms of a severe attack, giving the victim more time to get to the hospital. An anaphylactic reaction is extremely dangerous and can be fatal if not promptly treated. Even the children who had a prescription for an epinephrine auto-injector didn’t get the life-saving medication when they should have. In fact, kids who suffered the allergic reaction at school were more likely to have gotten the injection than children who had an attack at home. Admittedly, it was a small study. The researchers examined the case records for 408 children treated for anaphylaxis at a hospital. The study doesn't tell us why children suffering severe allergic reactions did not receive epinephrine before going to the hospital. It also does not address the reason that children who had been prescribed an auto-injector didn't use it, or whether the prescription had even been filled. It did, however, show that children who had gotten the shot of the antidote before going to the hospital were more likely to be sent home, while those who did not get the shot were more likely to be admitted. Dr. David Stukus, an allergist and co-author of the study, says the takeaway from the study is that parents, caregivers and emergency responders need to understand epinephrine should always be the first line of defense when treating anaphylaxis. 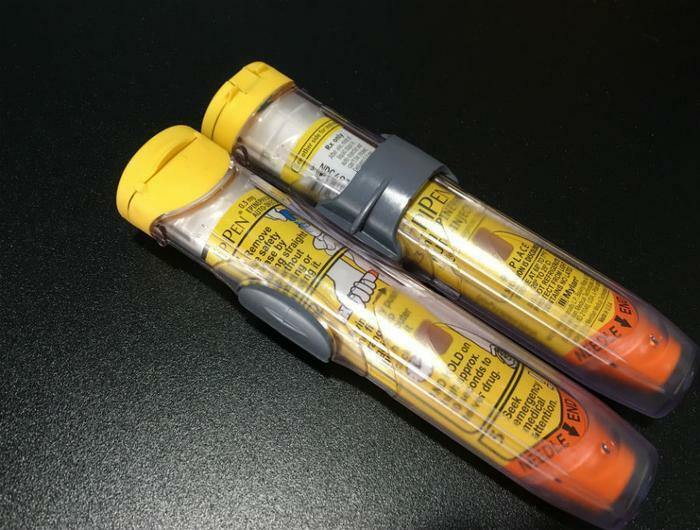 “Our study found that only two-thirds of those who had an epinephrine prescription had their auto-injector available at the time of their allergic reaction," he said. "It’s vital to keep your epinephrine with you if you suffer from any sort of severe allergy." In August 2016, Mylan raised the price of its EpiPen to $600 for a two-pack of auto-injectors, which are supposed to be replaced every six months. It sold for $57 in 2007. The company later introduced a discount program for patients without adequate insurance coverage. In June, the Food and Drug Administration (FDA) approved a competing product, a prefilled syringe called the Symjepi, made by Adamis Pharmaceuticals.